At what exact time was the Pale Blue Dot image taken? The date of the "Pale Blue Dot" photo is 14 February 1990, but is its exact time of capture (or at least hour) known? I was a school child back then, and I am trying to figure out what I was most likely doing at the time the pale blue dot image was taken. As far as I know, the raw data used to make the Pale Blue Dot image have not been preserved in NASA's Planetary Data System, which is why other commenters can't find it online. You might try contacting someone at the PDS Rings Node to see if anybody there has the data and metadata. Not the answer you're looking for? Browse other questions tagged voyager pale-blue-dot or ask your own question. Will Voyager 1 or 2 be able to take photos? 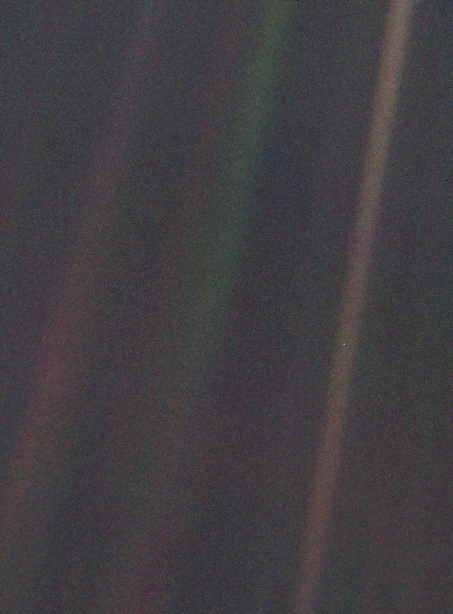 What is the brown band in which we find the pale blue dot that is Earth? What is the first non-solar-system object Voyager 1 will run into? Does Footage from Another Planet or the Outskirts of Our Solar System Exist? What is the possibility of Voyager 1/2 colliding with matter (Asteroids or planetoids) present in space? Why can't New Horizons send data and do observations at the same time? How many spacecraft have taken a “Pale Blue Dot” type photo of the Earth from beyond cis-lunar space?